A variety of gadgets and projects that will be used in the kitchen. Many of the basic kitchen items you have at home can be readily made up at camp, even if they dont perhaps work as well as you had hoped (I still have not perfected the automatic camp dishwasher yet). Most of these can be constructed as a matter of course in any camp. A bowl stand is perhap the most 'common' gadget made at camp. Simple to construct and useful it is a good item for those learning about pioneering and gadgets. All you need to do is select three suitable lengths of wood (good strong stout branches, not thin weak ones as they will not take the weight of the bowl of water).Simply lash the three branches together about one half to a third of the way down the length. Then open out the tripod so that the three legs are interlocking and 'resting' upon one another. Place a bowl firmly into the top and ensure the stand is sturdy. You may want to secure the feet by driving them into the ground a little. Note that several different lashing types could be used, although I recommend a simple shear lashing with frapping turns. The trick is to make the lashing and frapping turns slightly loose so that the tripod can open out. To finish off you can attach a cross frame around the top or bottom of the tripod and add optional extras like towel holders. 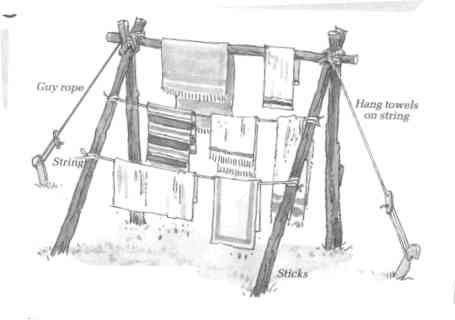 A line for drying those tea towels and sundry clothing items will be essential for any camp kitchen. This is very simple to construct, as you can see from the picture. Simply drive two uprights into the ground and lash a cross piece to join them across the top. 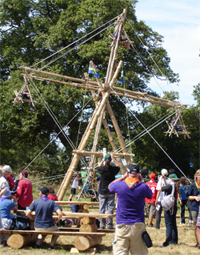 To ensure the structure is sturdy you could add two further poles lashed at an angle to form a simple 'A' frame at either end. Attach guy ropes to the two ends and peg out to keep the clothes rack on the ground in those high winds. You can add several lines by lashing ropes across the uprights (or even saplings), on which you can hang your towels to dry. A filter bin is another gadget that I would consider essential for the camp kitchen. Waste disposal is very important to handle correctly at camp, hygiene in camp is very important to control for everyone's good health. You will need to build at least two types of bins, one for dry refuse (e.g. empty packets, tins, sweet wrappers) and one for those with a 'wet' content (food slops, dirty washing up water etc.). Simply construct two 'box' frames formed from uprights driven into the ground lashed together. It would be good idea to site the bins in the same place, within the same frame. Attach a strong plastic bag within each box securing it firmly at the corners at least. Both of the bags should have perforated bottoms (use a fork to make plenty of small holes). The dry bin can be now left as is. The wet bin will now require lining with some material to absorb the waste. A sensible technique would be bracken on the bottom weighed down with small stones. A layer of charcoal and then sand/gravel should go on top of this, finished off with a layer of bracken. This will have all the properties to absorb all types of waste, water/grease etc. If you want to finish this off you could construct a lid to cover the bins (if you think the local wildlife will be inspecting the left-overs when you turn in for the night) although I would leave the lid off during the day for ease of use and to remind everyone exactly where they should be putting their rubbish! A bamboo cane will provide a natural cup if you cut the bamboo just below a natural joint (and the same for the next joint up, or the second joint up if you want to have a long tall 'jug'). You must take care to smooth the edges as roughly cut bamboo naturally has many sharp edges and splinters. You will need strips of birch bark. Do not just pull them off a tree at your local campsite, I don't think the warden will be pleased. 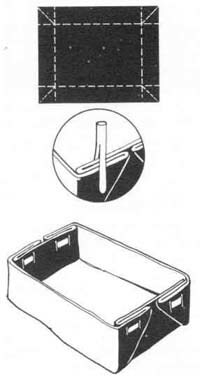 To make a square box type container, fold as shown in the diagram and either sew or tie in place once you have the shaper. A temporary fastening can be made using a split peg although this means the container will not hold a great deal of weight before it 'spills open' again. 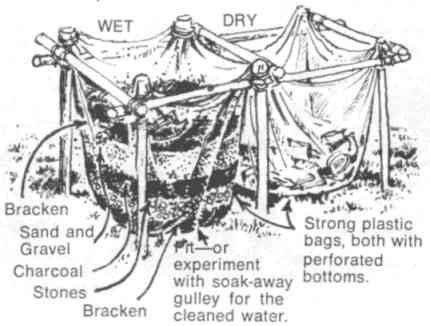 To make a waterproof drinking container simply fold the bark into a conical shape and sew in place. With care this could also be used for cooking in. To make a wooden spoon you will need to whittle a piece of wood down to size. Start with a fairly flat piece and mark the shape of the spoon upon it. Carefully and slowly whittle down to the required shape. Remember to always cut away from you and your hand. 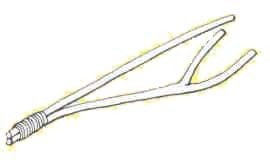 A pair of tongs can be easily made from two branches (each should have a natural curve to them so that they can 'pinch' easily) lashed together at one end. They should be made so that they want to 'spring apart'. A forked end to one of the branches will improve the grip of the tongs. If you want you can place a wedge under the lashings to improve the 'spring' of the tongs. Use for holding pots and hot rocks.